"At a recent party our friends went wild over this. 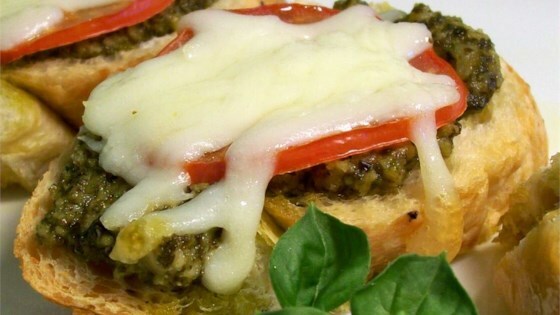 A simple pesto is spread on Italian bread and layered with roma tomatoes and cheese. It takes a little time, but it is worth it. I freeze the basil in ice cube trays, then put the cubes in freezer bags. You can easily take out and thaw what you need. Enjoy!" In a blender or food processor, puree the basil leaves, olive oil and garlic. Mix in the pine nuts and Parmesan cheese. Continue processing until desired consistency is reached. Slice Italian bread to desired thickness. Spread a layer of pesto on each slice. Top with roma (plum) tomatoes and mozzarella cheese. Place topped bread slices in a single layer on a large baking sheet. Broil 5 minutes, or until cheese is bubbly and lightly browned. See how to make a simple, versatile, and healthy spinach pesto sauce. You would expect the bread to be nice and crisp; however, the basil mixture is very moist and makes the bread slightly soggy. These are so freaken good! My husband and kids love these so much that I have to double the batch each time I make them. I agree with the last review, you can get away with less olive oil. I had so much basil in my garden, I was not sure what to do with it all. We tried this recipe and loved it. I even froze some for later. Thanks so much for submitting. I only had shredded mozzarella cheese and this turned out great! It was a perfect 'light dinner' with a glass of wine!